On almost every single Monday, Tuesday, or Thursday of the school year, one can simply walk out to East River Park and see discs flying, people diving, and everyone sweating. This is BHSEC’s most successful sports team hard at work, none other than the Bardbarians Ultimate Frisbee team. 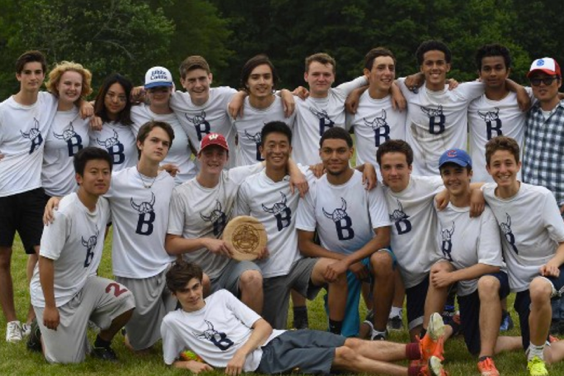 BHSEC’s ultimate frisbee program has recently ballooned in size and popularity, in part due to its continued success over recent years. At the beginning of this 2016-2017 season in September, a whopping 23 new players joined the non-exclusive club, more than doubling the previous team’s size. This prompted a division of near 40 players into two teams– one competing in NYC’s open division, and the other in the mixed division. The open team consisted mainly of returning players and was co-captained by veteran Connor Chin, Y2, and a younger protegé of his, Ishai Melamede, 10th. Their historic season started in an opening tournament in Arlington, Virginia, where they won four out of the six games they played, including a 9-8 comeback win against the high school that created the sport of ultimate frisbee, Columbia High School in New Jersey. They carried their momentum through an undefeated regular season (8-0) to the city championships, where they defeated rivals Stuyvesant High School in a universe point situation (essentially, next point wins). BHSEC defended last year’s championship title in spectacular fashion, and are now officially repeat winners and a known powerhouse team. They continued their hot streak into the state tournament in Middletown, NY where they won all 6 games they played and were officially crowned state champions. The mixed team was led by Livia Miller, Y1, and Eli Hecht, 10th, both first time captains. They were confronted with the challenge of honing the skills of 13 of the 19 new frisbee players, as well as dealing with the sometimes unresponsive organizers of the relatively new mixed division. Both captains noted that the going was, at points, tough, but was ultimately incredibly rewarding and fun. The team finished 3-4 in the regular season, playing a variety of other mixed and open teams. They also attended a mid-season tournament in Rhode Island, and returned home with the Spirit Award. In ultimate frisbee, a self-officiated sport at the high school level, the Spirit Award is a prestigious sportsmanship prize given to the team with the highest ratings from their opponents. However, the mixed team didn’t only show though that they were respectful players– their city championship win against Millenium Brooklyn High School spoke to their high levels of athleticism and skill. What can be said about both teams though, is the incredible extent to which each group of players bonded and improved over the course of the season. There is something truly remarkable about the Bardbarians program in that it is mostly student run. This definitely fosters a culture among the team not only of independence, but of real trust in one’s teammates. At the end of the day, everyone on the frisbee team are peers. Grade barriers dissolve and are replaced by friendships that transcend the field. Obviously, this is somewhat cliche. However, what is unique to the Bardbarians is that people take time out of their lives, three days per week, to play a relatively unknown sport. While we all love the game, it can be said for sure that when we go outside in the sun, cold, or rain, it’s about the people.